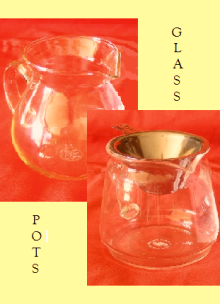 Glass Teapot with Warmer and Strainer insert, Set ‘Picco’, teapot 0.5l, teapot warmer Ø 10 cm x height 7.4 cm: glass teapot in elegant and at the same time functional design with compatible teapot warmer and strainer insert for the visual fit with virtually every tea. With our set ‘Picco’, your tea preparation alone or in small rounds will always be a guaranteed success! Glass Teapot with Warmer and Strainer insert, Set ‘Telja’, teapot 1.2l, teapot warmer Ø 13.5 cm x height 8.2 cm: glass teapot in elegant and at the same time functional design with compatible teapot warmer and strainer insert for the visual fit with virtually every tea. With our set ‘Telja’, your tea preparation alone or in small rounds will always be a guaranteed success! Lighted Glass Teapot with stainless steel warmer, Set ‘Illuminata’, teapot 1 l: Glass teapot in classic elegant and at the same time functional design with bottom-to-top light channel and compatible stainless steel warmer for the for the visual fit with virtually every tea. With the Illuminata lighted bright from the inside, attention and success are guaranteed for each of your tea servings in social gatherings or dedicated circles!